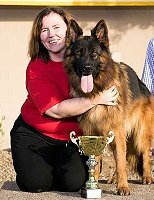 and outstanding achievements as a German Shepherd Breeder each year. "Fleischerheim German Shepherds" and Team Fleischerheim are comprised of a group of dedicated experienced German Shepherd Breeders trainers and show enthusiasts, both in the United States and Germany, working together to maintain the highest quality and standards for the German Shepherd Dog. Our modern German Shepherd Kennel is located on a 10 acre park-like property near Dallas, Texas. Our other family oriented German Shepherd Kennel is located in California. "vom Fleischerheim" is the registered kennel name of Bill Fleischer, America's leading German Shepherd Breeder and Importer for over 55 years. WE began our World Class German Shepherd Import and Breeding program in 1964. As a serious professional German Shepherd Breeder our continued efforts to improve the quality of our German Shepherd Imports and their resultant World Class German Shepherd Puppies remains the key to our successful program to provide great German Shepherd Personal Protection and Family Security companion dogs. See OUR RECORD SPEAKS FOR ITSELF for our Import, Breeding and Competition successes. With the advent of the North American Sieger Shows in the late 1990's Fleischerheim German Shepherds competed and was awarded #1 North American German Shepherd Kennel Group (#1 German Shepherd Breeder) honors in 1997, 1998, and 1999 by five German SV German Shepherd judges including the Vice President of the SV twice. We then "retired" undefeated from this competition. 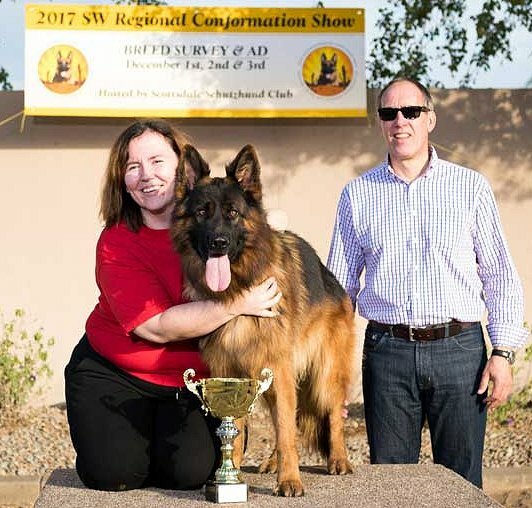 Prior to the inception of the USA and North American German Shepherd Sieger Show competitions, we imported and bred many German Shepherd Dogs who became CKC and AKC Champion German Shepherds. Our 55 years of expertise and personal relationship with many successful German Shepherd Dog Breeders in Germany enable us to thoroughly research the individual qualities and breeding compatibility of each German Shepherd Schutzhund trained dog considered for a mating. Some of the great German Shepherd Sieger and VA German dogs are not readily available to the average American German Shepherd Dog Breeder. Our connections enable us to make some of the more sought after breedings and the acquisition of outstanding GSD's for our World Class Imported German Shepherd breeding program here in America. The credentials of our elite World Class German Shepherd Breeding Dogs speak for themselves. (Our German Shepherd STUD DOGS) All are World Sieger, VA or V rated, Körklasse 1, Schutzhund titled IPO3 German Import German Shepherds exclusively. Our most notable Imported German Shepherds are the legendary top producer 2x World Sieger VA1 Yasko vom Farbenspiel SchH3, Kkl 1a, the 2006 North American Sieger and 2007 German Universal Sieger VA1 Bazi von der Urbecke SchH3, Kkl 1a and the 2006 German Bundesieger Champion and WUSV World Working Dog Champion, Caro vom Morfelder-Land SchH3. Our now retired top imported stud dogs also include the 2001 German and Italian Youth Sieger, 2002 USA and North American Sieger VA1 Rapi Supra SchH3, Kkl 1a, OFA who carries lines to all the top producing World Siegers, Ursus v. Batu son V1 Uran vom Moorbeck SchH3, Kkl 1a, sire of World Vize Sieger VA2 Quenn vom Loher Weg SchH3, IPO3, FH1, Kkl 1a, V1 Astor von Bad Waldle SchH3, Kkl 1a, son of World Sieger VA1 Zamp vom Thermodos SchH3, Kkl 1a. as well as Vize Sieger VA2 Voltan vom Gletschertopf SchH3, Kkl 1a top son of 2x World Sieger VA1 Larus von Batu SchH3, Kkl 1a and V Ken Rosenblick SchH3, Kkl 1a. Ken is the very rare Sieger Line German Shepherd with Working Line Schutzhund 1, 2, and 3 scores of 95, 96, 94 in protection.